Who doesn't love a fabulous purse? I am a lover of shoes and bags. 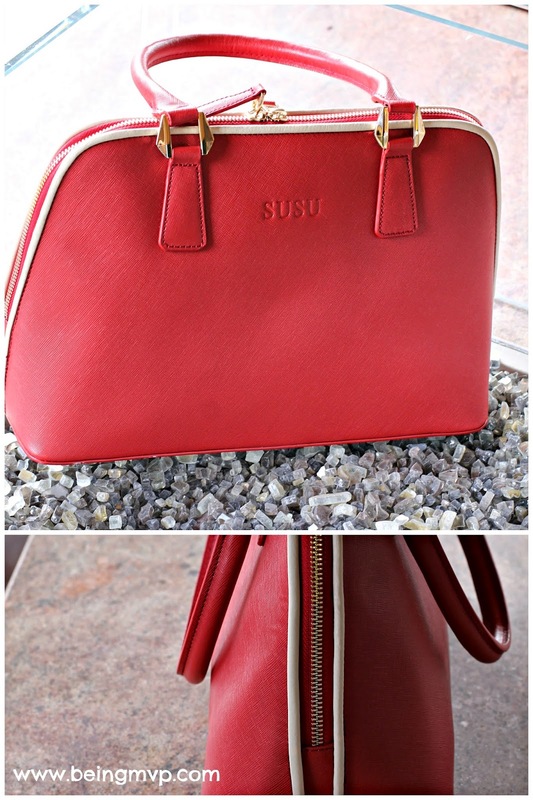 When I first saw the SUSU Handbags collection, I was hooked. The timeless designs as well as the luxurious materials put a smile on my face and I couldn't wait to get one. I selected the Melissa Saffiano Leather Dome handbag in red and it is beautiful. This is a classic shape handbag designed with rich, red textured leather. I love the zip detail that goes around the side. It allows for easy usage. The cream leather piping contrasts well with the red and adds an element of surprise. Feet are a must on handbags because they keep your precious bag protected against the grime of the ground. If you are on a power shopping trip and want to free up your hands, you can easily use the crossbody strap that is included. There is an interior zipper pocket to keep your precious items as well as two interior cell phone pockets for usb drives, lip balm, etc. Overall, I like that I can tote this bag from work to an evening out with friends as well as to the park on weekends. It's more versatile than I thought and I can't wait to add more SUSU bags to my collection. Who would love a SUSU Handbag for the holidays? One winner will choose the bag of their choice! *Continental US only (sorry AK, HI). Contest end 12/31/14. I would have picked the exact same one you did. That is absolutely gorgeous! I love that red bag! Absolutely beautiful. Love them! I have a bag (and shoe) problem too ;) I'd totally pick the Jody - black leather houndstooth shoulder bag - gorgeous! Whoa! That bag is gorgeous and such a classic! That red bag is gorgeous and now I need it! I have never heard of this brand thanks for the tip! 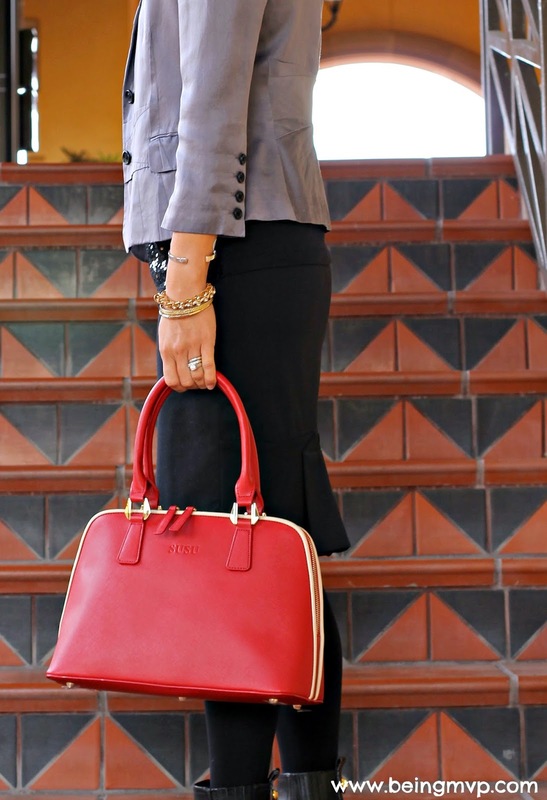 Love the red and how versatile this bag is! I seriously love the red bag that you chose and there are so many other cute ones. Love a great statement piece like this. Love the Black clutch. I would like a new Purse soon. I would choose the Saxon – Leather Crossbody Beige if I win. I really like the jody two tone black leather houndstooth bag! I love the Murray – Medium Crossbody Leather Satchel Orange. Thanks for the chance to win! I think I would pick the Melissa – Saffiano Leather Dome Satchel White HandBag if I won! I love the red Melissa bag you chose, as well as the black Mercer one on the website! I really love the Chole – Leather Satchel Grey! The Allen two tone tote in black is beautiful! I would love that one if I won. I'd pick the Waverly - Classic Satchel Camel. I would love to be able to choose the Ludlow – Saffiano Leather Tote in Dark! It would be perfect for every outfit! I love the Jody bag in both Houndstooth and Majoilica, as well as the Melissa bag in about 4 different colors. If I won it would be hard to choose, but I probably would go for the Jody – Two Tone Black Leather Tote Houndstooth Shoulder Bag since it would work with so many things I own. I like the Saxon cross body in cognac. I think I would choose the Stanton-Three Tone Leather Crossbody Brown. I would love to have the Ludlow Saffiano Leather Tote in red! I would choose the Susu Waverly-Classic Satchel in the Green. So pretty! My favorite is the Mercer - Medium leather Satchel in Black. Oh--so many great ones. I love the Warren classic. I would choose the Saxon – Cognac Pebble Leather Crossbody in Small.